Title page of the autograph of Sarasate’s Carmen Fantasy. To this day, the success of a new stage work crucially depends upon whether the individual scenes, ensembles or songs stick so strongly in the mind as catchy tunes that they become earworms. The persistent popularity of Georges Bizet’s Carmen undoubtedly owes a great deal to such of its easily-remembered numbers. Its première in the Paris Opéra-Comique on 3 March 1875 and the run immediately afterwards did not bring the great hoped-for success, but from the autumn of 1875 an unprecedented triumphal procession over European stages began – which, though, Bizet, who died three months after the première, was no longer alive to experience. Bizet, Carmen, Carmen’s part from the first edition of the score (1877), no. 5, Habanera, measures 1–6. Sarasate, Carmen Fantasy, first edition (1882), part I, measures 1–6. After the change from d minor to D major (as of measure 20), Sarasate varied the theme by embedding the chromatically descending melody in double and triple stops. Sarasate, Carmen Fantasy, first edition (1882), part I, measures 18–22. 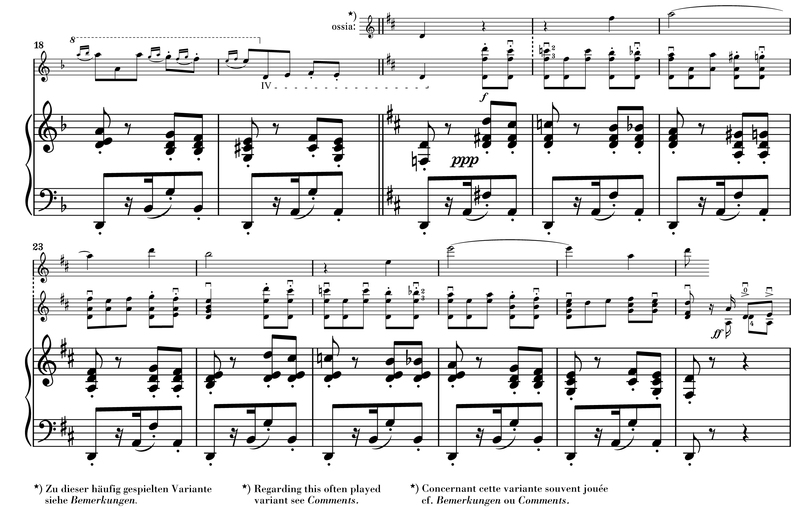 In preparing the recently-published Urtext edition of the Carmen Fantasy, Augustin Hadelich, who advised on the solo part, brought to my attention the fact that in this passage (measures 20–28) violinists would frequently play a cantabile counter melody to the theme repeated in the piano or orchestra, that is, the melody from Carmen’s repetitions of the crucial word “L’amour” in Bizet’s original, simply lengthening the duration of the tone and placing it an octave higher. Although I had noticed this variant, I had, as it turned out, underestimated how widespread it was. Bizet, Carmen’s part according to the first edition of the score (1877), no. 5, Habanera, measures 20–28. Popular variant for the violin in Sarasate’s Carmen Fantasy, part I, measures 20–28. Franz Waxman, Carmen Fantasie, measures 46–54. Waxman (actually, Wachsmann), originally from Germany, made his name in the US in the 1930s and 1940s as arranger and film composer. The fantasia on Carmen themes composed as part of his music for the film Humoresque is one of his best-known works, popularised especially by Jascha Heifetz who played it over the radio and in concerts. It seemed obvious that Heifetz must also have effectively incorporated this melody within the classic of the Carmen arrangements, in Sarasate’s Carmen Fantasy. Be that as it may: The question arose as to how we should deal with it in our Sarasate edition. The substance of the Urtext idea is to free the music text of all extraneous alterations or additions – which would actually exclude this extrinsic variant. The prevalent practice cannot, though, be entirely blocked out, for a violin student using an Urtext edition is likely to be confused at not finding any reference whatsoever to a variant that is known from numerous recordings. Here, we have a special situation in that a kind of meta-editing has occurred in the replacement of Sarasate’s original music text by an arrangement that is closer, curiously enough, to the original Carmen text than Sarasate’s composition is. Whereas Sarasate ignored Carmen’s melodic counterpoint, since his interest was focused on virtuoso variations of the underlying theme, this passage maintains Bizet’s basic conception, since the right hand in the piano retains the theme (= chorus in the opera), whilst the violin superimposes the cantabile gesture (= Carmen’s song). This entry was posted in Augustin Hadelich, Bizet, Georges, Carmen Fantasy (Sarasate), Ingolf Turban, Monday Postings, piano + violin, Saraste, Pablo de, violin + orchestra and tagged Bizet, Carmen, Sarasate. Bookmark the permalink.